This easy sheet pan salmon & green beans recipe is quick enough for a weeknight dinner — but fancy enough for a date night dinner! Naturally gluten free, and lemony garlicky buttery good. 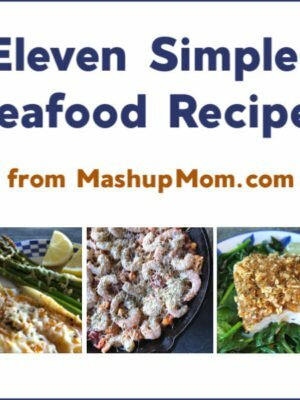 How about an easy spring sheet pan dinner in your April 16, 2017 edition of Sunday Scratchups: Your weekly recipe from scratch around ingredients that are either on sale or generally affordable. (And it’s not even chicken this time! 😉 ) Presenting: Sheet Pan Salmon and Green Beans with Lemon Garlic Butter. 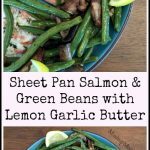 Springtime green beans and mushrooms have been on sale recently, so I decided to pair them with some clearance sockeye salmon fillets from my freezer for an easy sheet pan dinner recipe. Spray a rimmed baking sheet with cooking spray. 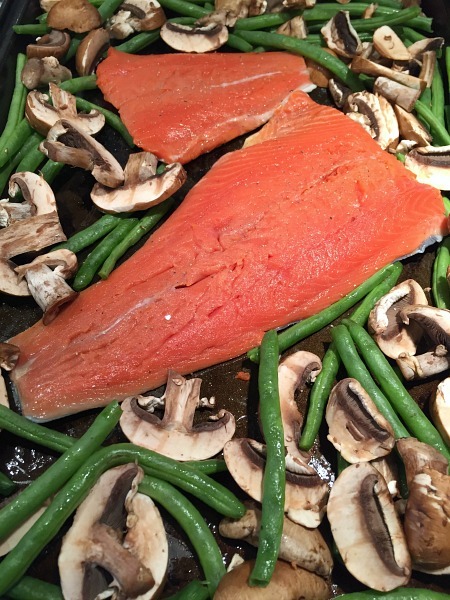 Slice mushrooms and trim green beans, then arrange the salmon and veggies on the baking sheet, keeping the salmon skin-side down. Season your fish with sea salt & pepper. 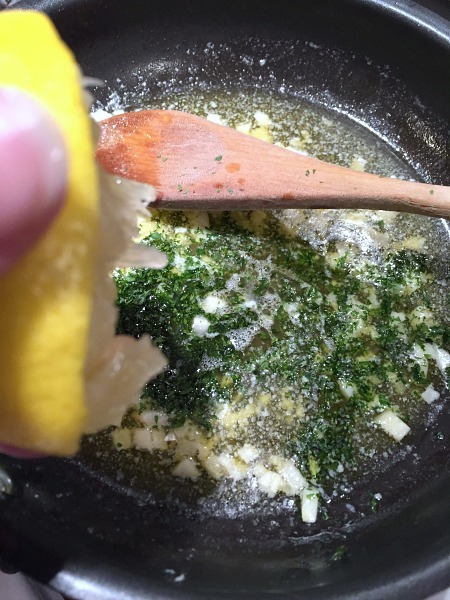 Melt butter over medium-low heat, add garlic and saute another minute, then remove from heat and stir in lemon juice and parsley. Brush fish generously with lemon garlic butter, then drizzle the rest over veggies and toss to coat. Bake at 425 degrees for 14 minutes or until fish flakes easily with a fork. This Easy Sheet Pan Salmon Recipe is Lemony, Buttery, Good! Here we’re giving the salmon and mushrooms time to cook through, while the green beans still have a little bit of a snap. 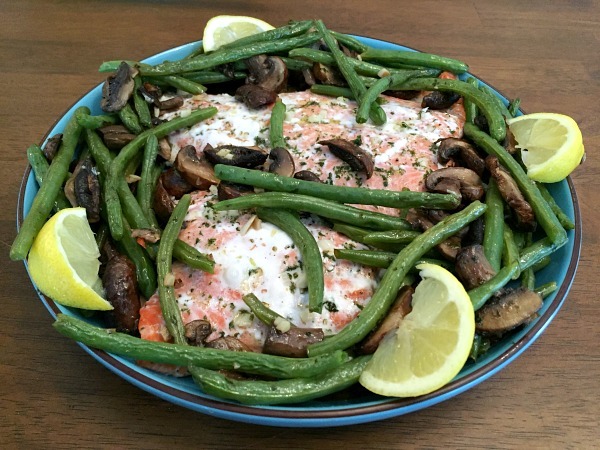 Serve your salmon & veggies with lemon wedges for an easy & flavorful all-in-one meal. This recipe is quick & easy enough for a weeknight dinner — but fancy enough for a date night dinner! Naturally gluten free. Serve your salmon & veggies with lemon wedges for an easy & flavorful all-in-one meal. 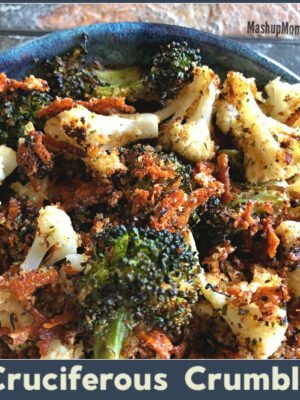 This recipe is quick & easy enough for a weeknight dinner -- but fancy enough for a date night dinner! Naturally gluten free. Spray a rimmed baking sheet with cooking spray. 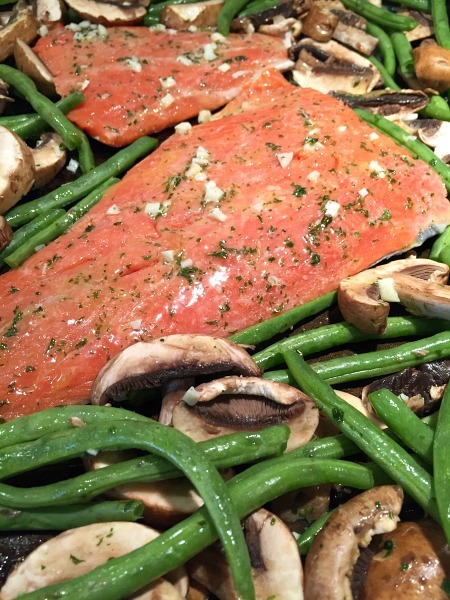 Slice mushrooms and trim green beans, then arrange the salmon and veggies on the baking sheet, keeping the salmon skin-side down. Season your fish with sea salt & pepper. Brush fish generously with lemon garlic butter, then drizzle the rest over veggies and toss to coat. Bake at 425 degrees for 14 minutes or until fish flakes easily with a fork. 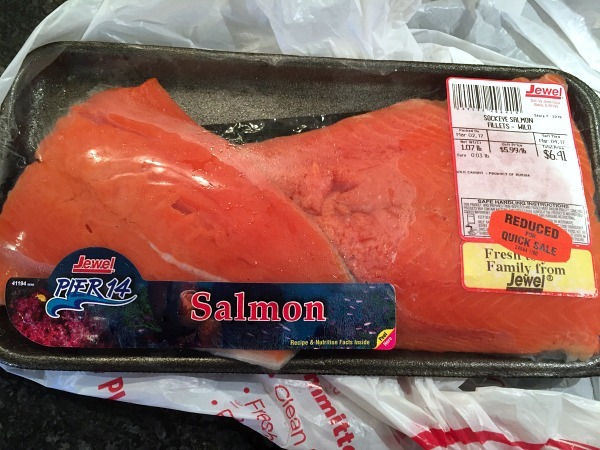 I love salmon but I never know how to cook it! This recipe looks great. I’ll be trying it soon ! 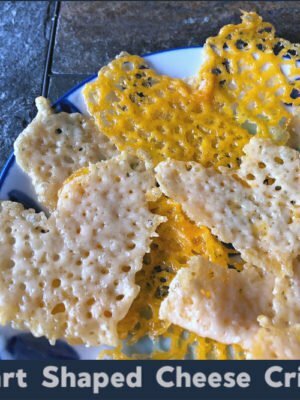 I tried it last night, super easy and tasty. I’m always hesitant to cook fish, because I’m not sure how. This definitely took the guesswork out of it! I used thawed frozen green beans, and added grape tomatoes on the side of the pan to roast at the same time—delish! Awesome! Grape tomatoes are a great idea, too. This was so good! Simple and easy to throw together. The lemon butter adds a nice kick to the vegetables. I added a head of broccoli as I had some leftover in the fridge and it was excellent. I’ll be adding it to my family’s regular rotation. 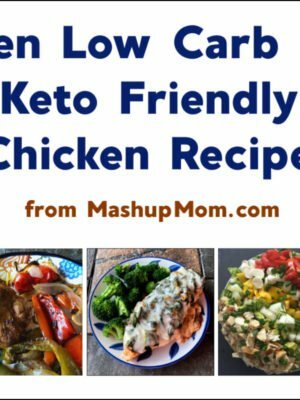 Thank you for making meal planning simpler! I truly value the time you put into this!